Nutrition International Ethiopia continues to focus on saving lives and improving the health of women and children. We work to ensure young children, between 6-59 months, continue to receive two doses of life-saving vitamin A, which provides a much needed boost to immunization systems. With support from the Government of Canada, Nutrition International Ethiopia is working to improve Infant and Young Child Feeding (IYCF) education for caregivers, including working to reach more young children (6 -23 months) with much needed multiple micronutrient powders to supplement local complementary foods to help reduce malnutrition rates. Support the Ethiopian Ministry of Health in the transition of vitamin A distribution from a campaign approach to distribution at routine contacts with health facilities in more than 3000 woredas. Scale up the use of zinc and oral rehydration salts to treat diarrhoea across with the country with a goal of treating 6.5 million cases by 2015. Our ongoing work through our Community-based Maternal Newborn Health and Nutrition Project to improve coverage and quality of care and nutrition for pregnant women and their newborns. Strengthen the ability of salt producers to properly iodize salt and work with partners to support efforts to enforce universal salt iodization legislation. Conduct operational research into factors that could improve adherence rates of pregnant women taking daily iron and folic acid supplementation on a daily basis. Assist community members in micro-fortification of staple foods. Nutrition International supplies 100% of the vitamin A used for supplementation in Ethiopia. Our efforts are focused on providing financial and technical support to expand the program into the two most populous regions of the country – Amhara and Oromia – as well as the region of Afar. We are also helping facilitate the transition of vitamin A activity from the parallel Extended Outreach Strategy to a more sustainable approach through the routine Health Extension Worker Program. In 2013, 9.3 million children between the ages of 6-59 months received two doses of life-saving vitamin A supplements nationally. In 2013, the Zinc Alliance for Child Health (ZACH) launched ZACH Ethiopia and invested $3.5 million to scale up zinc programming to treat diarrhoea. The project is focused on increasing awareness of diarrhoea as a serious childhood illness, as well as increasing the demand for zinc and oral rehydration salts as the treatment of choice for childhood diarrhoea. Each year, 27,000 children under the age of five in Ethiopia die from complications associated with diarrhoea. Zinc and oral rehydration salts are a simple solution. Treatment costs as little as 50 cents and save lives. The project is funded by Global Affairs Canada, Nutrition International and Teck. It is being implemented in close collaboration with the Federal Ministry of Health and local partners as part of a national strategy to reduce the burden of this disease. In 2013, 148,000 diarrhoea episodes were treated with zinc and ORS. Malnutrition among children remains unacceptably high, with 44 per cent of children under the age of five suffering from stunting due to chronic malnutrition. Childhood undernutrition is a complex issue, with many causes including inadequate diet, frequent illnesses, poor dietary diversity and low feeding and care practices. Nutrition International Ethiopia is undertaking two pilot projects in different regions with two different partners, to not only provide robust recommendations backed by solid analysis but also help the government scale up infant and young child nutrition interventions. Working with the Ministry of Health and key partners, Nutrition International Ethiopia is bring down malnutrition rates in youth children through community-based infant and young child nutrition programming. Our activities include improving the micronutrient and health status of pregnant women, newborns and children under five to ensure they not only survive but can thrive. We do this through training and support to health professionals on nutrition and child feeding practices, such as exclusive breast feeding, complementary foods, diversity in diet and feeding frequency. We support identifying and screening of severe acute malnutrition cases via Child Health Days in coordination with vitamin A supplementation programs. Nutrition International Ethiopia works to improve coverage, use, access and awareness of micronutrients for children under the age of five. Nutrition International is working in Ethiopia to increase the coverage and consumption of iron and folic acid supplementation amongst pregnant women. Many factors contribute to the low coverage – including frequent stock outs, outdated national guidelines, lack of interest and poor knowledge by health workers and an inadequate monitoring system. Nutrition International is trying to address all these issues through its support. 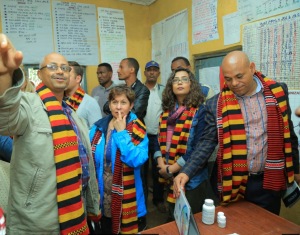 In the current phase of the program, Nutrition International is conducting operational research to develop promotion strategies for IFA adherence in the regions of Amhara, Oromia, SNNPR and Tigray. The strategies will be scaled-up nationally and target 2.5 million pregnant and post-partum women over three years. For more information about our work to improve women’s and newborn survival and health, please visit our maternal and newborn health page. Nutrition International is supporting iodization efforts by the many groups involved in the salt-producing region of Afar. We have donated iodization machines, purchased tractors and water tankers, and constructed multipurpose buildings to fill the complex needs related to salt production and distribution around Lake Afdera. Nutrition International is working with Federal Food, Medicine and Health care Administration and Control Authority to strengthen capacity for strict enforcement of Universal Salt Iodization Legislation 204/2011. In 2013, approximately 98,000 metric tonnes of additional adequately iodized salt was produced with Nutrition International support. We continue to build the capacity of the salt industry for production and quality control of iodized salt and of the food standards agency. In the Afar region, Nutrition International is working with the Ministry of Health and partners to improve maternal health services, through support from the Government of Canada. Our community-based maternal and newborn health and nutrition demonstration project has a strong focus on training health extension workers and traditional birth attendants. For more information about this project, please visit our community-based maternal and newborn health project page.